Eat Reality Check: What Would Really Happen If Fast Food Workers Actually Got A Pay Raise? Reality Check: What Would Really Happen If Fast Food Workers Actually Got A Pay Raise? Ever since the McDonald’s household budget memo leaked, revealing that the megabrand expects employees to have another job to survive, debate has been raging about whether fast-food employees need a pay raise. With the recent one-day strikes of chain employees bringing more attention to the issue, a lot have people have weighed in, and plenty of fuzzy math has been bandied about (HuffPo even had to retract a story titled “Doubling McDonald’s Salaries Would Cause Your Big Mac To Cost Just 68¢ More” due to some error-ridden analysis it got from a university researcher). 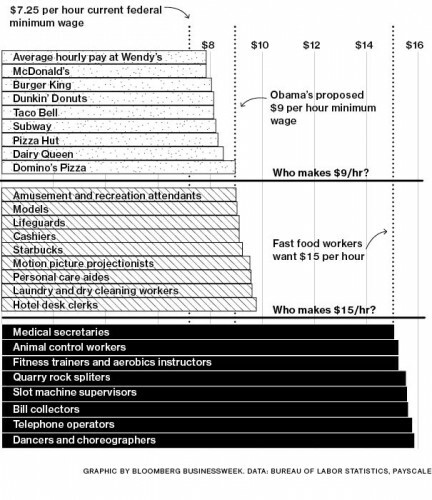 For a more level-headed analysis, BusinessWeek published an interesting article today contextualizing fast-food industry wages, and looking into the ramifications of an industry-wide raise. Politics aside for a moment, the basic economics of the situation break down like this: While employees should definitely be paid fairly for their hard work, the restaurant industry already has notoriously small margins, especially in the case fast-food chains are unable to enjoy profits from wine, beer, and cocktail mark-ups. The $15-an-hour wage being proposed amounts to two-thirds pay increase, and would place fast-food workers in the same earnings range as professions such as a medical receptionist, an aerobics instructor, or an animal control worker (based on data from Payscale.com)—all industries with greater profit margins. Needless to say, fast-food giants aren’t going to simply roll over and give up a portion of their profits without a major fight. Most of them are multinational corporations, after all, and they usually have two distinct arms of their operations—company-owned locations and privately owned franchises. Franchises have to pay a royalty fee to the parent corporation, which greatly affects their bottom line; as a result, it’s unlikely that they would agree wage increases until they worked out a more profitable deal with their overlords. Of course, scale allows major fast-food chains to make serious money despite small margins at individual locations—McDonald’s posted profits of $5.5 billion last year. If wages were increased to $10.50, a number proposed by some highly educated economists after years of research, it would only increase costs for these major chains by 2.7 percent—an increase that would likely go unnoticed by consumer paying out an extra couple of coins for their Big Mac.